Princess Ann (Audrey Hepburn), heir to the throne of her home country, is on a public relations tour of Italy. She spends her days waving, meeting diplomats and doing interviews on a rigid schedule, while always remaining perfectly proper. She is tired of that life, which is causing her to have a nervous breakdown, and she simply wants a day to let loose. One night, she decides to sneak out of the embassy to see Rome. Unfortunately, she was given some sleeping medication to calm her nerves and she falls asleep on a random wall. A reporter named Joe Bradley (Gregory Peck) finds her and tries to help her, thinking she is simply some drunk woman who needs to get home. Not knowing what to do with her, he lets her spend the night on his couch. In the morning, he discovers who she is and knows that an intimate story would mean big bucks. So, Joe takes her out around the city to show her a good time, never letting on what he really does or that he knows she's the Princess in the hopes of getting a great story. 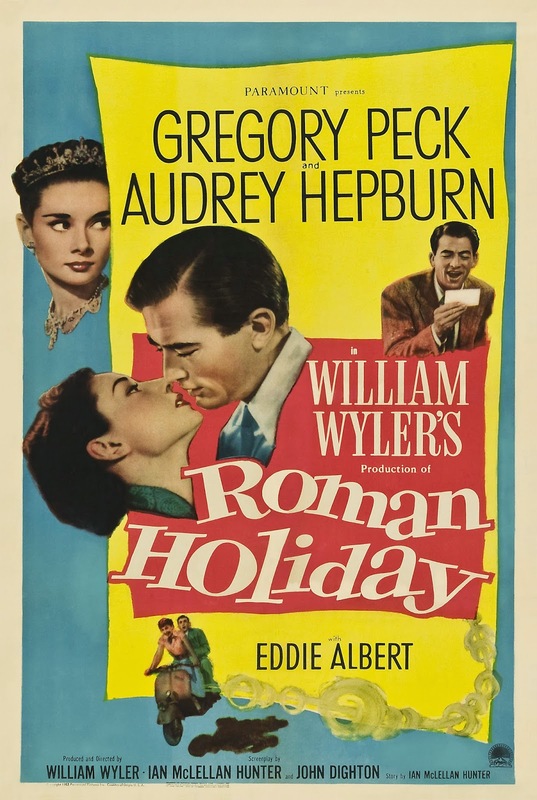 "Roman Holiday" is a charmingly humorous romantic comedy which is actually a little light on the romance, but it matters not because it is still a great movie. This is not a love at first sight film where the two protagonists gush romantically from the get go. Really, for much of the movie, Joe, played by the suave, devilishly handsome Gregory Peck, is not trying to win Princess Ann's heart, but is simply using a tour of Rome as an excuse to squeeze her for information so he can write an exclusive story about her for his newspaper. Over the course of the day, they do grow closer, but it never becomes apparent until later in the movie that they have strong feelings for one another. Even on the flip side, Princess Ann was not trying to have a fling with a random American in Italy, but rather simply trying to have a day away from her responsibilities. Joe provided that for her and she had the time of her life. This film boasts a great cast. Audrey Hepburn is excellent in her role as Princess Ann and took home the Best Actress Oscar for it, too. Hepburn is able to portray the regal look and feel very well as she has an upper-crust way about her, from her beauty to her speech and mannerisms. She can also step out of that realm and show an almost childlike innocence as she has new experiences for the first time. From giddy to throwing a fit like a child, Hepburn produces a great performance all around. Then, there is Gregory Peck, who is one of the finest actors of his generation. He is able to convey so much emotion just by using his eyes. Peck's deep and sultry voice, giving off a staccato every now and then, adds so much to his personality. He is endearing yet sort of rugged, but always maintains his charm. And finally, there is Eddie Albert, who plays news photographer Irving Radovich. Eddie provides a lot of humor to the film as he is the victim of a comedic assault of spilled drinks and tipped chairs as Joe tries to stop him from spilling the beans about their true profession. He also has to find creative ways to take the Princess's picture without her knowledge. All of this, of course, is set against the iconic and beautiful backdrop of post-war Rome, Italy as they tour the city and see the sites. Originally meant to be shot in color, "Roman Holiday" benefits from being a black and white film as it gives it a much more intimate and honest feel. Without giving too much away (in case you haven't had 62 years to see it), we love the way this movie ends as it is not something that is seen or accepted too much in film these days. It's actually quite perfect as is. Though a little slow to start, this is one of the best and truly splendid romantic comedies that is perfect for Valentine's day! One year ago, we were watching: "Inside Llewyn Davis"